From vibrant shades to pistachio chartreuse, the green color can bring to any kitchen a new look and a fresh attitude. Here are a few green kitchen ideas to turn your kitchen’s look into a better and a beautiful one. With every season the leaves in green change color, similarly you can use different shades of the green leaves to make your kitchen look exotic and beautiful. A combination of natural golds, greens and browns in the cabinets of the kitchen stand out against the bright green counterparts, with a few woodworks in earthly tones and hard wood with beaded-board backs. Pistachio green can make a kitchen a look extremely luxurious and classy. A pistachio green cabinet as the masterpiece and cream tones sink mimics along with limestone tiling. This type of color palette makes the kitchen look very soothing yet wonderful and gorgeous. Seafoam green is the color like that of the ocean which appears green sometimes due to the rays of the sun. With a pure white floor and the cabinets in seafoam green, the kitchen can look astonishingly beautiful and marvellous. With this, you can add pale yellow, or lime green accessories to complete the look. Stainless appliances also go well with this shade. Key lime is a vibrant shade of green. It brings a lot of energetic and positive vibes in your kitchen. Along with this key lime shade, wooden accessories go very well. The cabinets with wooden frames will make a fantastic look for the key lime theme of the kitchen. Add some white polka dots along side to enhance the beauty of the overall theme and make it look more exotic in a neutral and natural way. To give the kitchen a warm yet attractive theme, farm green shades which include a mix of pale and rustic green shades is a good idea. Island style furniture with leafy green shades for the cabinets make a great look and add so much more than just color. They give the kitchen an electric buzz of nature and curiosity both. With a brown sink and rich green finish to the accessories, the look will come out amazingly well with a classic farm flavor. White utensils will look great with these shades. 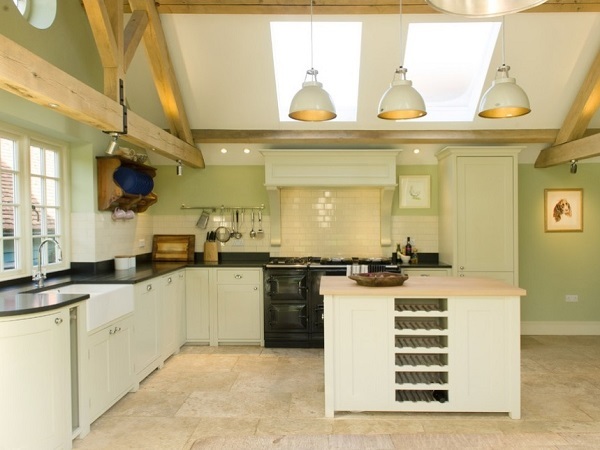 White cabinets and cottage green make a perfect look for a kitchen. With beige granite accessories and sea green island tiles, a neutral look will come out perfectly for a kitchen. Wooden flooring will always go the best with this kind of look. This is one of the most vintage looks for a kitchen and is not going to get old anytime near. Kitchen is a very important place of your house and it should be impeccably beautiful. With a lot of green along with a combination of a few other colors, the look of the kitchen is going to come in a beautiful way.